You have declared that “No challenge poses a greater threat to future generations than climate change” and showed leadership in vetoing the Keystone XL pipeline bill. Why then, would you allow Shell to drill in Arctic waters after a Nature study declared that Arctic Oil MUST be kept in the ground to prevent catastrophic climate change? One solution that has not been paid enough attention to is to reduce the demand for oil by offering the American public financial incentives to annually drive less (miles); avoid flying entirely, and reduce the amount of electricity they use annually in their homes. This proposal would benefit those who don’t add to the greenhouse gas burden on the atmosphere and oceans and cause other forms of pollution related to fossil fuel burning (including the need to drill and ship oil from the Arctic), who are often those in our society who need supplemental income the most to get out of poverty. Make it pay not to pollute! Right now, too many Americans are using the atmosphere as a “free” sewer to deposit their emissions from excessive burning of fossil fuels, often for recreational travel or other forms of entertainment (travel to “away” sporting events …). See proposal at http://www.allthingsenvironmental.com for more information. 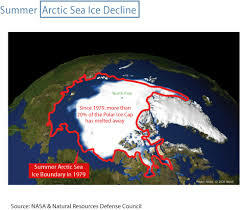 Arctic oil must be left in the ground in order to avoid the catastrophic effects of climate change. The risks are simply too great to allow drilling in this fragile and important ecosystem. See NASA’s “Vital Signs of the Planet”.